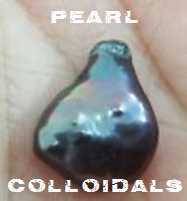 These Colloidals are made from a South Sea Baruque Multicolored Pearl. The pearl in the picture is the exact pearl used in electrolysis. Centuries ago, using pearls as medicine was common, especially among the wealthy. A German monk, Albertus Magnus, in the 13th centuryrecorded pearls as medicine were good for "mental diseases", affections of the heart (also know as love-sickness) and in hemorrhage and dysentery. Also in the 13th Century, Alfonso the Learned of Castile and Lion, recommended pearls for "paplatations of the heart and for those who are sad and timid, and in every sickness which is caused by melancholia because pearls as medicine purify the blood, clear it and remove all its impurities." According to Alfonso pearls as medicine should be swallowed in an herbal mixture after first powdered, but in cases of melancholia, is was suggested that they be "daubed on the eyes, because they clear up the sight wonderfully, strengthen the nerves and dry up the moisture which enters the eye." The book of Aristotle is where he claims to have gotten his advice for use of pearls as medicine. In actuality, pearls as medicine are alkaline and contain calcium, and therefore would be useful as medicine for soothing heart and stomach upsets, especially when coupled with the right herbs. "Pearls are made from the dewe of heaven which dewe the shellfysk margherita receyveth in certain times of the year." This is quoted from the ancient history book, Pliny's Natural History. The following is a recipe for "Aqua Perlata," pearls as medicine are "most excellent for resorting strength and almost for resuscitating the dead." It's found in Anselmus de Boot"s book written when he worked in the early part of the of the 17th century in the royal court of Emperor Rudolph II of Hapsburg. "Pearls first dissolved in vinegar, lemon juice or in spirits of vitriol or sulfur. Fresh lemon juice is added and the whole mixture sweetened with sugar. Now if there be 4 ounces of this solution, add an ounce each of rosewater, of tincure of strawberries, or borage flowers and of balm and two ounces of cinnamon water. Then shake well before using. Nothing more excellent can be had." This was recommended for "pestilential and pernicious fevers".--pearls as probably actually worked because of the vitamin c in the juice and a touch of calcium in the pearls. Pearls have been known for their healing properties for centuries, particularly in traditional Asian medical systems. In these cultures, “medicine” deals with more than just physical ailments and cures, and substances like gold, silver and pearl powder are believed to have effects both physically and metaphysically. Pearls have been used throughout medical history to help treat disorders of the digestive tract, muscular systems and the skin. Powders and potions containing pearls have also been developed to aid in fertility, as well as in easing the discomforts of the birthing process. Many cultures and societies have made similar claims for this lustrous gem. The Chinese, for example, have depended on the healing properties of the pearl for centuries. They have used it to treat everything from simple eye ailments to serious heart problems, bleeding, fever and indigestion. To this day, the Chinese still use pearl powder as a skin whitener and a cosmetic, as do many other people around the world. In fact, the pearl is widely considered to be effective in controlling the skin conditions rosacea and acne. Due to these natural properties, as well as its elegance and beauty, the pearl has been associated through the ages with the “matrix of life” itself. Proponents allege that the pearl helps to balance the human body’s natural rhythms and hormone levels with lunar cycles. There are also those that claim that the pearl can bring inner wisdom and help to strengthen and nurture the growth of love. Pearls are thought by others to have very strong “magnetic” powers and have been used in “gem therapy” to strengthen nerves, the adrenal glands, the spleen and muscle tissue. As with many other stones, pearls come in a wide range of colors that each project their own messages. White pearls, unsurprisingly, are said to promote good health. The rare black pearl is a lucky gem indeed. Cream colored pearls project success, gold is said to bring good fortune, lavender is a symbol of love, and pink brings happiness to the wearer.